The devices enable multiple architectures to enable manufacturers to implement their design of choice to easily interface with all major smartphone operating systems. These systems allow the graphical user interface of the phone or tablet to be displayed on the vehicle’s screen and enable integration with voice commands inside the car, all while simultaneously charging the mobile devices. They also enable driver assistance applications on mobile handsets to be integrated with a vehicle’s infotainment system. 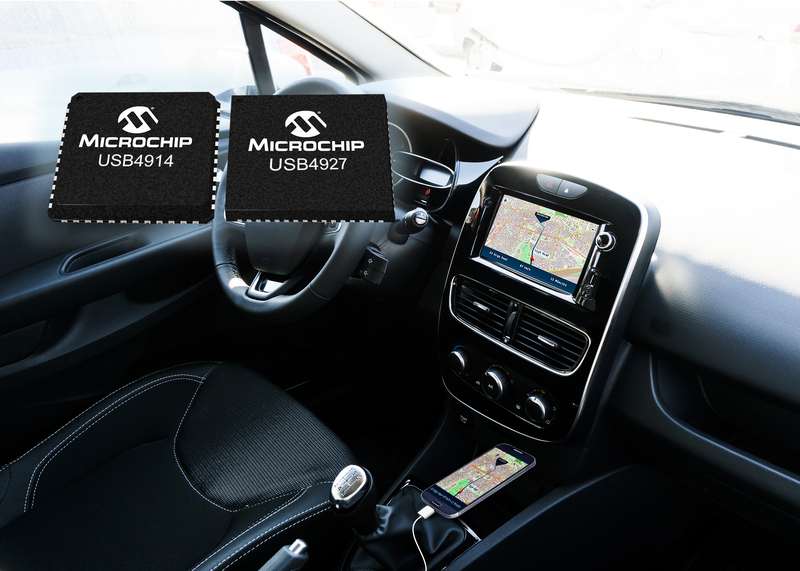 Microchip’s new smart hub ICs enable cascading of the hubs to the second- and third-row seats with simultaneous data and charging in all ports. For example, if there are dual USB ports, one port can connect the phone or tablet to the head unit, leaving the other port free to charge and upload/download data. With Microchip’s new USB4914, USB4916, USB4925, and USB4927 smart hub ICs, car manufacturers can customise solutions to meet their design needs. As the car becomes more of an entertainment environment, manufacturers can create solutions that allow consumers, for example, to use one phone for navigation and another for music or video. A demonstration application board and evaluation board are available for each of the new USB 2.0 smart hub ICs. The demonstration application board emulates a system that a tier one supplier or Original Equipment Manufacturer (OEM) would use in their application. Microchip also provides a USB Power Delivery application showing charging for the USB PD 3.0 specification. The USB4715, USB4914 and USB4925 are offered in a 48-pin QFN package and the USB4916 and USB4927 in a 64-pin QFN package. All devices are available today in volume production. For more information, visit Microchip’s Web site at www.microchip.com/USB4914.